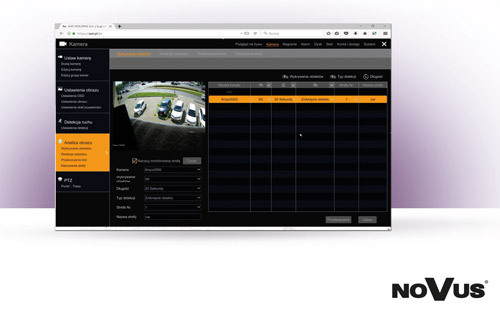 NOVUS IP 6000 series DVRs in cooperation with IP 3000 series cameras with intelligent functions enable the use of image analysis functions such as object detection, sabotage detection, line crossing and zone violation. All functions mentioned above, so far available exclusively as standalone camera functions, are now fully configurable via the recorder settings menu. Their configuration is sent automatically to the cameras, so a computer is not required to configure the cameras using a web browser. For a single camera, we can define the Sabotage Detection function and one of the other image analysis functions. The following events can be distinguished and detected by the Sabotage Detection function: change of the observed scene, image blur, color error. In the case of the Object Discovery function, the algorithm analyzes both the disappearance and abandoning the object. The Cross-line function allows you to define up to four lines in the camera's memory, with only one always active. Same as Zone Violation function. You can take an alarm action for all of the above functions. We have the following options to choose from: screen capture, activation of the alarm output on the camera, setting the camera in a defined way, buzzer activation, full screen camera display or sending an e-mail with an attached photograph showing the event. Enabling the push on server in the recorder is a very valuable and appreciated addition of the alarm action. As a result, on the mobile phone, in the notification tab, information about events is displayed when the SuperLivePlus program is turned off. This allows a quick response to an event that has been registered at the facility. After confirming the notification, the software that displays in live mode the image from the camera that triggered the alarm automatically starts. The function is active according to the previously programmed schedule.